Gettin' Tarty, To-Do Lists, and an Overdue MeMe | What Smells So Good? Hmm, I'm not quite sure how to describe the past few days around my house, except they are busy! Between my often-talked-about bakery enterprise, planning for Thanksgiving and chauffeuring the sister in the mornings, not to mention hitting the gym when I can, it's a wonder I want to write at all! But you know me, I can't put the pencil (keyboard?) down for long! I'm on a break right now from the baking spree (still have 2 apple pies to do, after making some cookies after chocolate chip cookies and 3 batches of brownies!) but soon I'll be back at it, I figured I would share some of my past little experiments with you cherished readers before I get down to business with this awesome MeMe that Valli from More Than Burnt Toast tagged me for some time ago. Okay so the "tart" part of this post: after making my pumpkin pies for Martha yesterday, I had a bit of the left over pastry dough laying around that I didn't have the hear t to throw away (especially after yesterday's post). So I cogitated (whoo hoo, big word for the day!) and came up with a treat for Andrew: Strawberry-Chocolate Tart! There is no real recipe for it, I took the leftover pastry from these pies, shoved it into a muffin tin and sprinkled a layer of chocolate chips on the bottom. 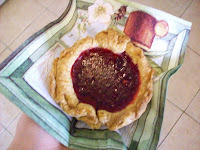 Then I topped it with a layer of pure fruit strawberry jam and baked it for 20 mins less than the pie did. It looks so pretty! I also made pumpkin custards, which was just the leftover filling in greased muffin tins baked for the same time as the tart. Not as pretty, but I'm sure they're tasty. 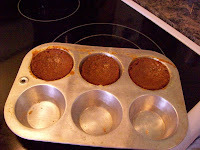 IF YOU HAVE A BLOG, POST YOUR MEATLOAF EXPERIENCE as an entry by October 16, with "National Meatloaf Day" in the title. Please send an email to jenn@seriouseats.com with the following details: Your name, blog URL, URL of your National Meatloaf Day post, and a picture for your entry in the roundup. Bake or buy a bread, take pictures (if possible) and blog about it on Tuesday, 16th October 2007. Please link back to this announcement in your post, and eventually to the roundup. Send an email to worldbreadday(at)gmail(dot)com including - your name- your blog's name and your blog's URL- the recipe name and the post's URL- your location (region and country). Submissions can only be accepted until Wednesday, October 17. Once you've created and posted your entries, please send an e-mail to me at MarieAlice@cheerful.com by no later thanmidnight on October 20th, 2007. Please put "Show us Your Sarnie" in the subject line. I will try to post the round up by no later than October 21st, 2007. After that, you will have nine days to check in and vote for your favourite entries, at the end of which time, I shall pick a winner, to be announced on October 31st, 2007! The only request I would make is that you place a link in your post linking it back to my journal and this post. For those of you who hate the meme thing, you can stop reading here. Otherwise, let's continue on to 7 random things about me! Once again, I mention that it was Valli from More than Burnt Toast who tagged me for this, and if you get a chance, please do read her blog, it is wonderful! I know that many food bloggers limit themselves to food related trivia, but frankly there isn't really that much foodie background to me. I'll try my best, anyway! I used to live off of Nutella sandwiches, or Kraft peanut butter with Beehive corn syrup on it. The way I ate it? One piece of bread, spread with PB or Nutella and folded in half. Simple, inelegant, but boy was it good! When I was in Grade 9 (13 at the time), one afternoon my friends and I ate our way through a frosting container each. I think there may have been refrigerated cookie dough eaten that afternoon too. I guess thats one of the ways I ballooned to 226 lbs (subsequently lost on Weight Watchers). I was a carnivore (turkey burgers and grilled teriyaki steak, anyone?) until getting sick in my first year of university, when I became unable to digest milk products, any meat or poultry, high-fat fish, caffeine or alcohol, along with pretty much any type of oils or fats. Let me tell you: eating out = not so much fun anymore, especially since I used to crave cheese capelletti in rose sauce from East Side Marios! I met the love of my life and my fiance Andrew in Culinary Arts class in Grade 10. I had a serious crush on the boy but was too shy to talk to him about anything other than the brutality of our large-batch Rice Krispie Square or cookie recipes. Little did I know that he liked me too (something I only found out after we had dated for a few months). My skin has taken on a yellowish tinge due to the amounts of pumpkin that I consume. Think of the orange tint that babies take on when their mothers eat a lot of carrots, but in adult form. You have me! I used to work at Tim Hortons. My favourite doughnut at the time was the (now obsolete) Caramel Cappuccino (esssentially a Boston Cream donut filled with cappuccino cream instead). Once Andrew (who had worked there for years before me, and was essential in getting me the job) had the baker draw a heart design on the fondant icing with caramel for me. What a sweetie, eh? I have no idea who has and hasn't been tagged yet, but if you haven't been and would like to participate, consider yourself tagged! Drop me a line so I can check out your answers and learn a little something about you! Great MEME Sara! I enjoyed learning something more about you. I like pickled onion sandwiches(but lets not spread it around). You should try Nutella in Sm'ores. Mmmmm!!Good!!! !Is Nutella still something you can indulge in? ?